The new Canon PowerShot SX260 HS travel-zoom narrows the gap to the market-leading Panasonic TZ series by offering a much longer zoom, more features and fixing some of the issues that afflicted its predecessor. Full 1080p HD movies make the SX260 HS a more than competent all-in-one camera for both photos and video, while the effective built-in GPS system differentiates it from the slightly cheaper but otherwise identical SX230 HS model. The new 25-500mm, 20x zoom lens offers a broad focal range that makes it possible to frame up subjects near or far in pretty much an instant, pretty amazing given the size of the SX260 HS which is only a little larger than most compacts. We're glad to see the back of the flash unit that always popped up whenever the camera SX230 was turned on, and also the inexplicable 6-step delete image process which slowed down operation. Fast 10.3fps burst shooting at full 12 megapixel resolution is another big improvement offered by the SX260 HS, although we'd have liked longer battery life when employing the GPS. Image quality is on a par with the previous SX230, that is to say very good. The employment of a back-illuminated sensor helps the SX260 to perform well in low light, with a usable ISO range of 100-800 and even the higher settings proving adequate for web use and smaller prints. The inclusion of full manual controls makes the SX260 HS as well suited to more experienced users looking for a compact alternative to their DSLR as it is the beginner, although as you'd perhaps expect there is no raw format support to sweeten the deal further. Despite looking outwardly similar to its predecessor, the PowerShot SX260 HS represents a big step forward for Canon's travel-zoom cameras and is a real challenger to Panasonic's TZ30 model. 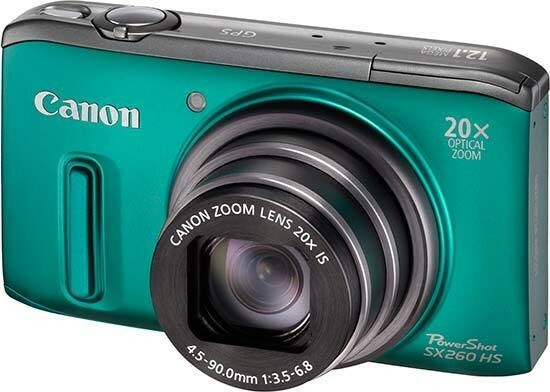 Anyone looking for a pocket camera that can shoot high quality stills and video both near and far should seriously consider the exciting new Canon PowerShot SX260 HS.